I returned from a four-day trip to Chicago yesterday, and despite the somewhat frigid weather, I thoroughly enjoyed myself. 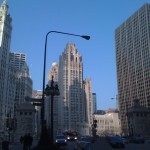 Chicago is a wonderful city and has much to offer its visitors. Thursday night we had a late lunch at Noodles and Company, a chain-restaurant that serves up tasty stir-fried noodle dishes, salads, and homemade soups, before walking to Millennium Park. 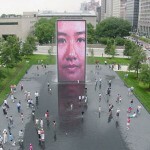 Millennium Park is a compact, grass-covered area downtown with video sculptures, an amphitheater, and a view of the lake. Later that night, we headed to NV Lounge, a chic, top-floor lounge with a nice bar and secluded balcony. Friday we went to the Shedd Aquarium, a large indoor-aquarium, and the Field Museum, a history/science museum, located downtown. There was a school field trip which made the museum and aquarium quite busy. This may be an indication that Friday is not the ideal day to visit. The aquarium had a great 4-D IMAX movie about sea creatures and an enormous selection of fish, sharks, and stingrays. Over at the Field Museum we saw Egyptian tombs and an underground exhibit on subterranean insects. At night, we headed to Navy Pier, where we explored the unfortunately, mostly dead area of shops, and then mistakenly dined at Billy Goat Tavern. We ate paper-thin, chalky burgers which needed gallons of soda just to be swallowed. Hey, not every meal can be perfect. Saturday we visited the Museum of Contemporary Art which had some exquisite abstract pieces including video installations, photography, and furniture. Next, my sister and I decided to leave the downtown area and metroed over to Division Street. Division Street is a main thoroughfare lined with funky shops and restaurants. There we found an authentic Mexican restaurant (sorry, I can’t remember the name but it’s across from a WaMu near the Division metro stop), where we dined on burritos with barbacoa and chicken-filled tacos. Later that night, we had drinks at Kerryman Irish Bar, a cozy bar with wood floors, good beer, and a quite atmosphere. For dinner, we ate at Rockit, a trendy restaurant with a nice variety of menu options. The tuna burger was pretty good but needed wasabi and soy sauce. But the sweet potato fries were superb. 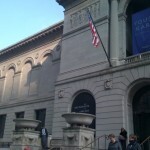 Finally, Sunday we found our way to the Art Institute of Chicago. The Art Institute houses impressionist masterpieces from the likes of Monet and Seurat, as well as Japanese prints, ancient artifacts, and sculptures. On exhibition was the photography of Yousuf Karsh. He essentially used innovative techniques to photograph nearly every influential person of the 20th century including artists, celebrities, politicians, and philosophers. The best part of this day, however, was hot dogs at The Weiner’s Circle. 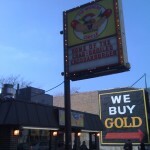 Located in Lincoln Park, Weiner’s Circle offers up juicy, chargrilled hot dogs and sausages and delectable french fries. If you have a chance, I recommend checking it out. Overall, Chicago is a great city, and despite the harsh weather (at least on Thursday), it was definitely worth the visit. Previous PostPrevious Future Spring Cruise?